Heat oil in saucepan. Add onion, carrot and garlic, cook until soft. Add beef mince, cook until brown. Stir into tomato paste, chopped tomatoes and chicken stock. Season with salt and pepper. Cover and cook gently for 20 minutes. Melt butter in a separate saucepan, stir in flour and cook for 2 minutes over gentle heat. Remove from heat, stir in milk. Return to heat, stir until thick and smooth. Season with salt, pepper and add mozzarella cheese, stirring over low heat until cheese melts. Preheat oven to 180 degree Celsius.. Pour 1/2 cup of meat sauce into lightly greased baking dish. 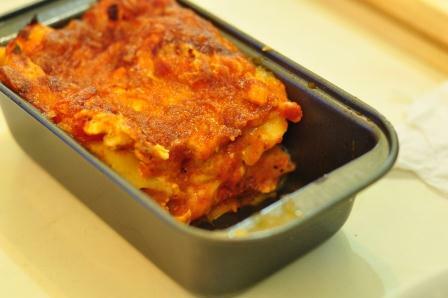 Alternate layers of lasagna sheet, meat and cheese sauces, ending with cheese sauce layer. Sprinkle with grated parmesan cheese, bake in over for 35 minutes or until cooked through. Test if cooked by pricking with a fork.